Take the trip of a lifetime: A customized wildlife and tiger tour! EXPLORING the national parks in India was, hands down, one of my favourite travel experiences of all time. 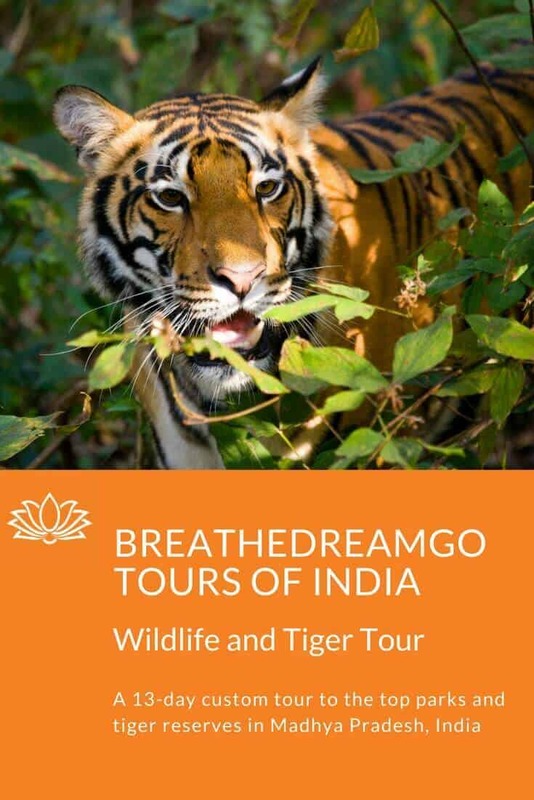 I am thrilled to announce that I am offering the Breathedreamgo Wildlife and Tiger Tour to some of India’s top tiger reserves as a custom tour. This is the trip of a life-time as you will be travelling with the top-rated safari lodge company in India, Pugdundee Safaris. 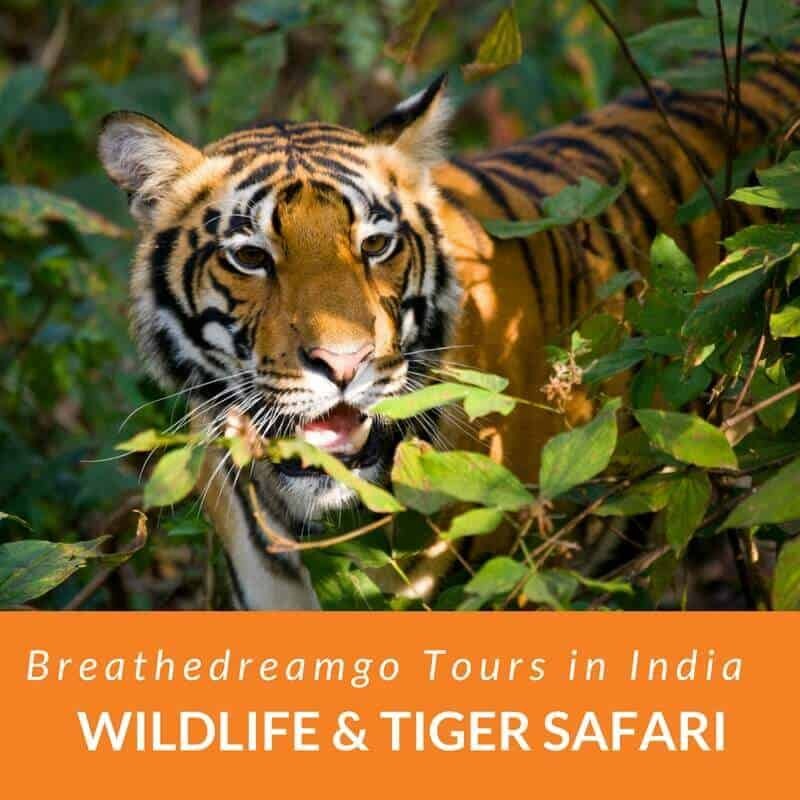 The Breathedreamgo Wildlife and Tiger Tour is organized and sold by Pugdundee Safaris, and was designed specifically for Breathedreamgo readers. You will follow the same itinerary I created and followed in March 2018 — our group saw six tigers, a sloth bear with two cubs, and a pack of wild dholes, among many other animals. But now, you can take this tour at your convenience, on the dates that suit you, and with the people of your choosing, or even alone. 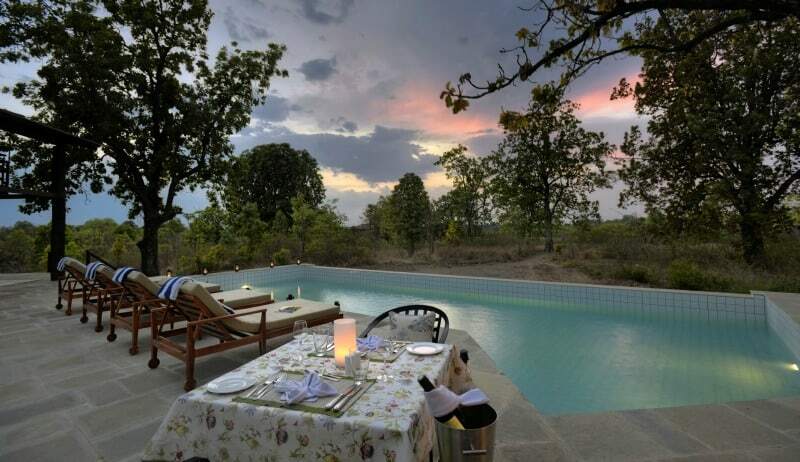 Pench Tree Lodge pool Photo courtesy Pugdundee Safaris. 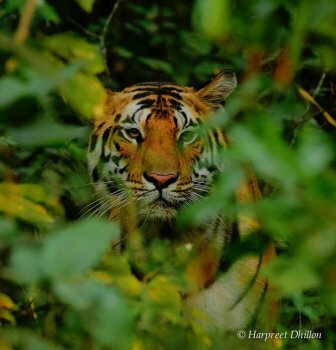 This is a very special trip, a wildlife and tiger tour with lots of extras. 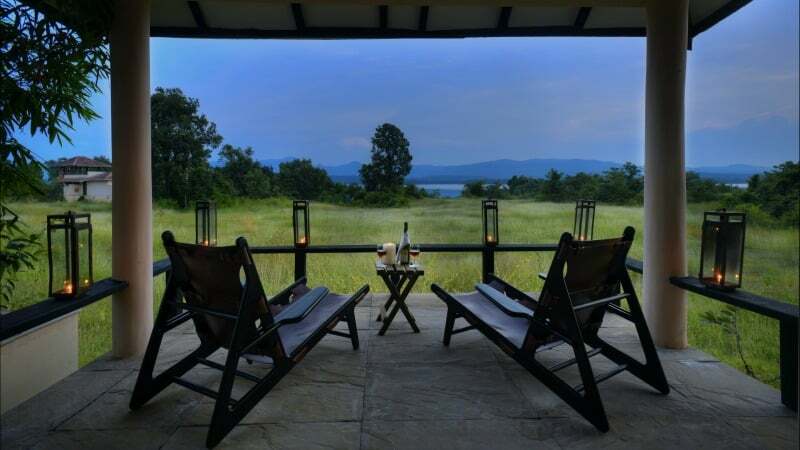 You will stay in Pugdundee Safaris award-winning lodges, be guided by their talented naturalists, enjoy delicious local foods, and take part in some very special, customized experiences – such as walking safaris, a boat ride, village visits, hiking, and one overnight camp in Satpura National Park. At least 9 game drives, in Satpura, Bandhavgarh, Kanha, and Pench are guaranteed – which means your chances of seeing wildlife such as sloth bears, barasingha, wild dogs, and tigers are excellent. The national parks in India, are incredible, you will not be disappointed. On safari in Pench National Park. Photo courtesy Pugdundee Safaris. Seeing a tiger in the wild is on many peoples’ bucket lists — but there is so much more to see and experience in India’s national parks. 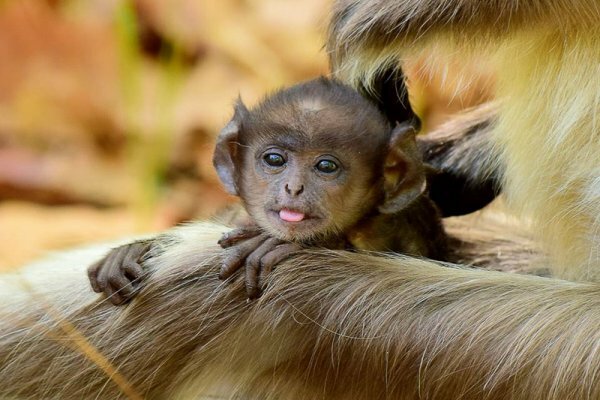 It’s about the entire experience of immersing in the jungles and forest of India, and learning about the trees, butterflies, and the diversity of animals – such as sloth bears, barasingha deer, golden jackals, wild dogs, and nilgai. And about the local culture, the indigenous people, the villages, and art forms. You can read about the diversity of India’s animals here. Yes, your guides will attempt to see tigers, but not to the exclusion of experiencing the culture and natural world of central India. There are only about 3,200 tigers left in the world, and 70% of them are in India. To see a tiger, you need three things: a good naturalist, a good opportunity, and of course good luck. On these tours, you will get the two things that are within control: good naturalists and a good opportunity. 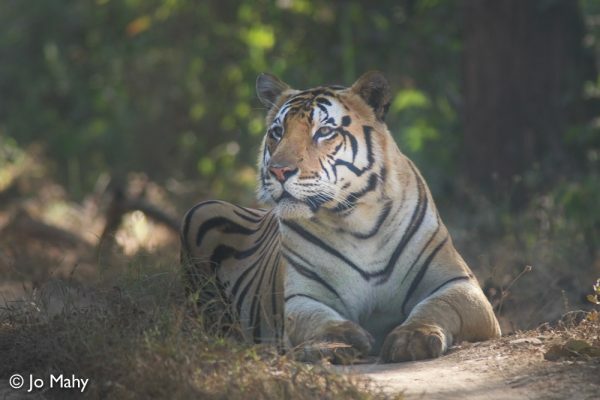 Kanha and Bandhavgarh are two of India’s top tiger reserves, and two of the best places in the country to see tigers. So, you will definitely be in the right place! When you travel with Pugdundee Safaris, you get a LOT for your money. 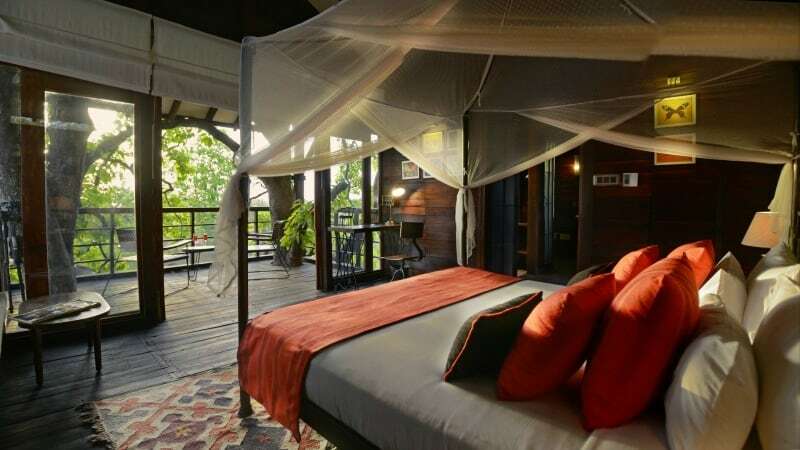 You stay in some of the most luxurious and sustainable safari lodges in India, in your own cottage villa or tree house. 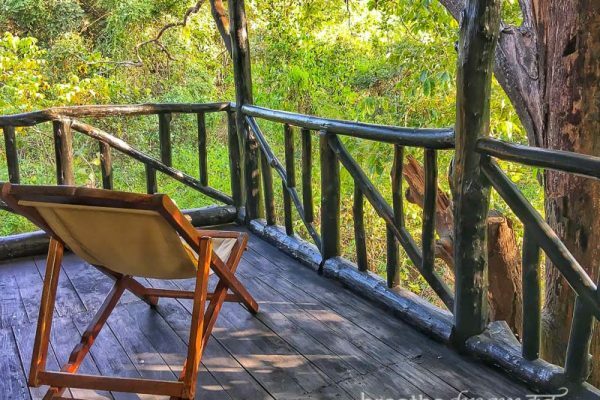 Pugdundee Safaris lodges are located far away from the commercial areas that are near to the park gates, in a truly wilderness environment, close to local villages. The food is outstanding, with much of the produce coming from the lodges’ own organic gardens. And the service is the best it can be – friendly, professional, and responsive. But the best thing about staying at a Pugdundee Safaris lodge is that you get the services of top-notch naturalists, who are extremely well qualified and speak perfect English. I cannot emphasize enough how important this is to having a truly amazing experience in the national parks in India. It literally makes 100% difference. With naturalist Harpreet Dhillon at Kanha Earth Lodge. Photo courtesy Pugdundee Safaris. The cost for this trip includes almost everything: transportation in India, airfares in India, full board at the lodges, all activities, at least seven game drives, park entrance fees, the services of naturalists. Tree house room with a view at Pench. Photo courtesy Pugdundee Safaris. NOTE: Costs below are for 2018 and 2019. The trip is costed in INR (Indian rupees) and then converted to USD, and can change due to currency conversion rates. India is a fascinating travel destination that often bewilders first-time travellers. We can help you prepare for your first trip, and you can read this Pre-departure information booklet from Pugdundee Safaris for the essential stuff. The view from a room at Denwa. Photo courtesy Pugdundee Safaris. Transfer back to airport for flight to Bhopal. Drive to Bhimbetka for sightseeing. Later drive to Tawa Dam (about 2 hours) for a boat cruise up to lodge. Morning drive 3 hours to reach the starting point of mobile safari. About 4 hours’ trek through lovely sal forest inside Satpura National Park to reach Denwa view point for lunch. After lunch trek further 2 hours to reach mobile camp. Retire at camp for overnight stay. This is an incredible opportunity to go on a walking safari in a tiger reserve! After breakfast, one-hour walk, and drive 4 hours to reach Pench Tree Lodge. Stay in a tree house! Morning game drive in Pench national park. Afternoon visit to organic garden followed by cooking class by an expert chef. Cycle the Pench-Kanha Forest Corridor with lunch break in the jungle. 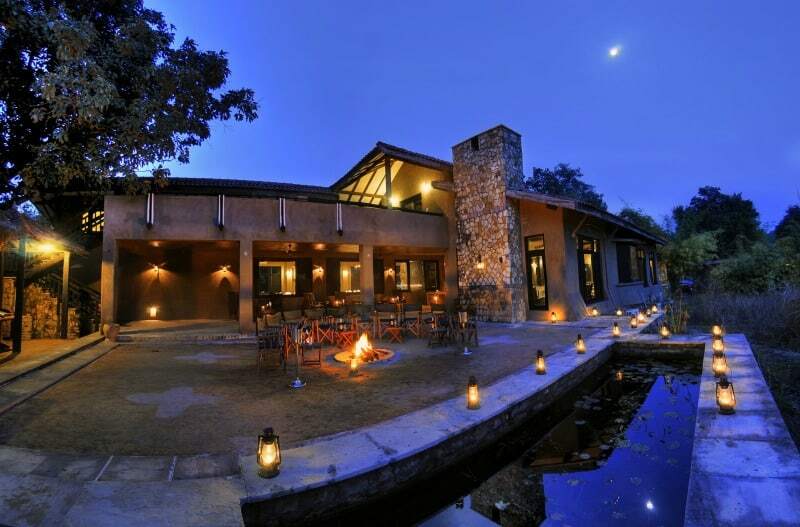 Later drive to Kanha Earth Lodge, one of the most prestigious and award-winning lodges in India. 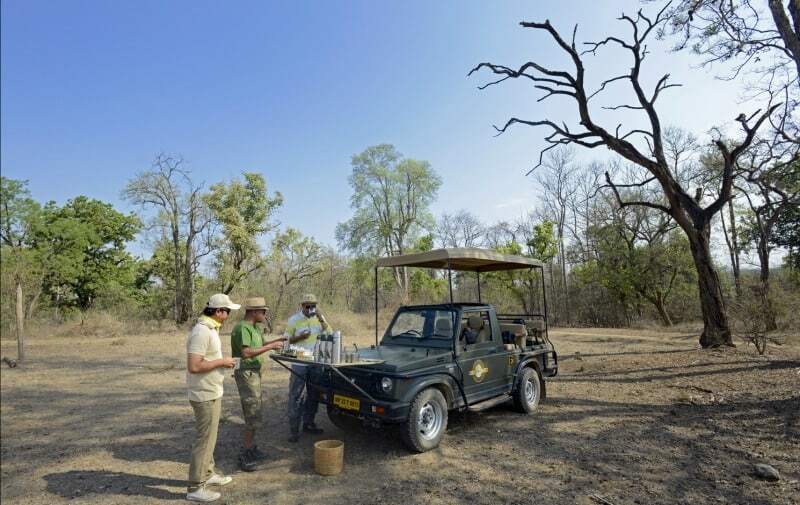 Morning and afternoon game drives in Bandhavgarh national park. A night view of King’s Lodge. Photo courtesy Pugdundee Safaris. Airfares for both Jabalpur – Delhi and Delhi – Bhopal sectors. 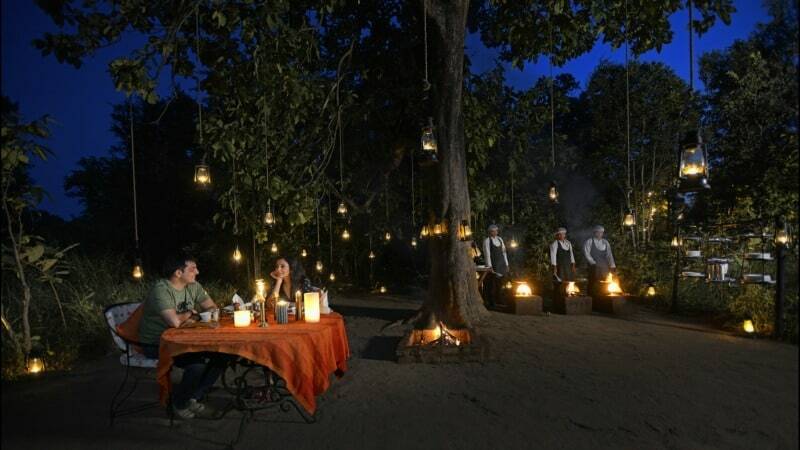 Field dinner at Kanha Earth Lodge. Photo courtesy Pugdundee Safaris. 50% advance payment 135 days in advance and balance before 60 days prior to arrival date. In keeping with our heightened security procedures, we request all guests to carry a photo-identity to present at check-in. Foreign nationals are required to present their Passport and valid visa. This should be the same as submitted at the time of safari bookings. Our standard check-in time is 13:30 hrs and check out time is 1100 hrs local time. 20% cancellation fee will be charged on all bookings.